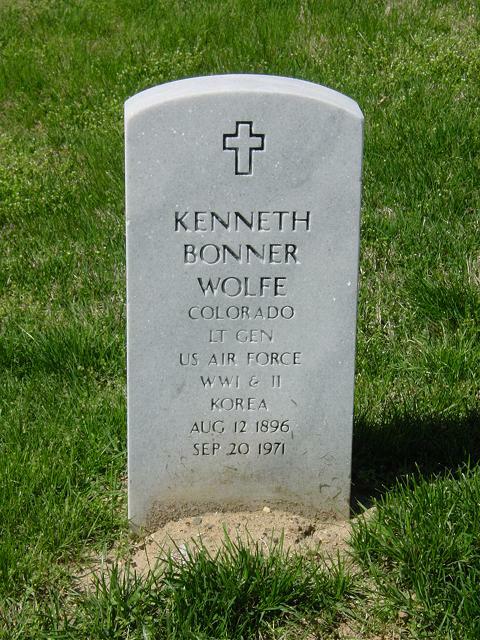 Kenneth Bonner Wolfe was born in Denver, Colorado, in 1896. He attended high school in Portland, Ore., and San Diego, California, and in January 1918 enlisted as a private first class in the Aviation Section of the Signal Reserve Corps. He received ground and flying training at Berkeley, California, and Park Field, Tennessee, and in July 1918 was commissioned a temporary second lieutenant in the Air Service. He served for a brief period at Park Field as a flying instructor and then moved to Souther Field, Georgia., in the same capacity. In January 1919 he returned to Park Field and in March of that year went to Carlstrom Field, Florida. In July 1919 he was made officer in charge of flying at Souther Field, Georgia, and the following January was appointed chief engineer officer at the Air Intermediate Depot at Americus, Georgia. On July 1, 1920 he received his Regular Army commission as a second lieutenant in the Air Service, and was promoted to first lieutenant that same day. He began a tour as flying instructor at Brooks Field, Texas, in November 1922, and during this time assumed charge of aero repair at that station in addition to his other duties. In May 1926 he moved to Clark Field, Philippine Islands, as plans and operations officer. Returning to the United States in August 1928, he became engineering officer and parachute officer at Langley Field, Virginia. In May 1926 he moved to Clark Field, Philippine Islands, as plans and operations officer. Returning to the United States in August 1928, he became engineering officer and parachute officer at Langley Field, Virginia. In July 1930 he entered the Air Corps Engineering School at Wright Field, Ohio, and after graduation in June 1931 remained for duty in the Inspection Branch, of which he later became chief. He was detailed to the Air Corps Tactical School at Maxwell Field, Alabama, in August 1935, and graduated in June 1936. A year later he graduated from the Command and General Staff School at Fort Leavenworth, Kan., and was assigned as Air Corps representative at the Douglas Aircraft company in El Segundo, California. In March 1939 he was named assistant chief of the Production Engineering Section at Wright Field and the following February became chief of that section. As chief of the B-29 Special Project Staff he had charge of the initial flight and service testing of the B-29 Superfortress for the Army Air Force. He later was appointed chief of the Production Division of the Materiel Center at Wright Field. In June 1943 he became commanding general of the 58th Bombardment wing at Salina, Kan. Later, under General Wolf's leadership, the 20th Bomber Command was organized, trained and moved to India for its initial strikes against Japan from bases in western China. On June 15, 1944, he directed the first B-29 strike against Japan, which was staged from secret bases in western China. The following month he returned to the United States to take over the Materiel Command at Wright Field. In September 1944, when the Materiel Command and Air Service Command were consolidated into the Air Technical Service Command, he became chief of engineering and procurement. He left Wright Field in April 1945 for a temporary assignment at Army Air Force headquarters in Washington. He joined the Fifth Air Force on Okinawa in August 1945, as chief of staff and became commanding general two months later. After assuming command of the Fifth, he directed its transition from a mighty assault force to the occupational air arm of Japan and southern Korea, operating from headquarters at Nagoya, Japan. In January 1948 he returned to the United States and was appointed director of procurement and industrial mobilization planning at Air Materiel Command headquarters at Wright Field, Ohio. He was appointed deputy chief of staff for materiel at U.S. Air Force headquarters in September 1949. Rated a command pilot, combat observer and aircraft observer, General Wolfe has more than 7,000 hours flying time. He has been awarded the Distinguished Service Medal with oak leaf cluster and the Order of the British Empire. General Wolfe was buried with full military honors in Section 34 of Arlington National Cemetery.